The thumbscrew was used during the Middle Ages. The victim's fingers were placed inside the instrument and slowly crushed as the torturer turned the handle on top. This method was primarily used to extract confessions as it was both painful and very lasting. If the victim refused to speak, the torturer could choose from many other torture methods. The same instrument was also used to crush victim's toes. 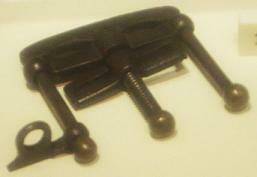 A bigger variant of the instrument that followed the same principle was used to crush victim's feet, knees and elbows. The Head Crusher was used for crushing the head. A similar device was used for medical purposes in order to straighten the fingers of warriors who had been injured. The effectiveness of such instrument is debated.